A friend of mine wrote a story that is a helpful discussion starter and I asked him to guest blog today. The story is a metaphor of life and the followers of Jesus. I share it with you here. Let me know how this story affects you. Picture us as a group of people locked in a cage. Our daily needs of food and water are met through a hole in the side of the cage. The edges of that hole are razor sharp, but we need food, and so I reach through to pick up what I need, but I cut my arm in the process. Day after day, no matter how many ways I try it, I can’t pick up the food without getting cut. People often mock me, tell me daily how wrong I’m doing it, and offer their advice of the right way to grab the food. But I can see the cuts on their arms, as fresh as mine. Others offer food for sale, I bought it once, but the soured portions were too small. They didn’t satisfy, and the seller insisted on more payment before he would part with any more food. If I want to eat, the cuts from the cage will be the price I have to pay. One day somebody new arrives, they don’t offer advice, they visit with me. When they see me cut myself reaching for the food, they quietly reach into their bag and retrieve bandages. Carefully, they take hold of my arm; they look at the wound and make sure it’s not too deep. They bind it with gentle hands. The next day they show up again. They ask me how my wounds are doing, and when I cut myself again getting today’s food, they retrieve the same bandages and tenderly wrap my arm again. Every day the same: I cut myself reaching for food, they treat the wounds. They clean them and check to make sure the old cuts are healing well. On days I can’t bear to reach through the hole, they share their own food with me. They talk with me as I lament the way things are. We become close friends. Then one day, while they’re cleaning a fresh cut, I notice their arms, they have scars, but they’re long since healed. “Your arms,” I ask, “why don’t you have any cuts?” They reply, telling me they have a friend who gives them food for free. I’m skeptical, I’ve never heard of such a thing in this cage. They continue, “My friend has been giving me food for a while now, and you can see my cuts are all healed, in fact it was my friend who healed them, and that same friend has given me the bandages I’ve been using to treat your wounds.” “That’s not the way it works around here,” I insist. “What’s the catch?" “No catch,” the response. “Doesn’t sound right to me,” I say. “You should be careful”. We continue like this for days. Weeks even. My friend doesn’t push the conversation about his friend, but he’s present every day; talking with me, caring for me, sharing his food. Always my friend has fresh food and bandages, but never does he reach through the hole in the cage. Never are there fresh cuts on his arms. “It’s only words.” “Actions speak louder than words.” “How can you tell if a politician is lying? His lips are moving.” We make these statements and many more like them; but there is another reality. Our words are the only true currency of character that we will ever have. Let me say that again, “Our words are the only true currency of character that we will ever have.” If we spend this treasure with empty or false words, we will never be able to recover our reputation and will be poor indeed. Words may be just words, but they are very important. Words represent a contractual agreement between conversational participants. Sometimes we can rely upon the facts of how this person has acted in the past. Sometimes, words are all we have. I am challenged to always make my words true and easy to digest. I want people to sense that every one of my words has been carefully chosen for its meaning in the present context. I want people to be able to understand and trust me. Will you join me in a culture changing revolution? The only ones who stand to lose may be the litigation lawyers; but they can find work other than lawsuits against those who tell untruths. Oh God, my Father, when it comes to the resources I need for this life and the work you have prepared for me, all I need is everything. I just need Your power, Your Spirit, Your grace, and Your will. I like to think that I can contribute something. But, in truth, I cannot. I can only respond with gratitude. All I need is everything; that is all; oh . . . and the ache in my heart that this song causes . . . but then . . . you have already given that to me. As we approach Easter, our church is reading slowly through the Gospel of John. Today’s reading was from John chapter 8 which contains the story of the woman caught in adultery (read it here). This reading reminded me of a song Mike Charko and I wrote a few years ago and so I share it with you here. It tells the story from the perspective of the woman. Materialism is a philosophical concept that asserts that everything is, or can be explained, in relation to matter alone.1 Many secular humanists and atheists subscribe to this without reservation. But lately, Materialism is a philosophy in decline. Like many other “sacred cows” of contemporary culture, there are ideas surfacing which will challenge its status in the world. It was once thought that time and space, dualism, determinism, reductionism, locality, causality, realism, and materialism were absolute.2 Today, some quantum theorists and experimental physicists would suggest that these are not as irrefutable as once thought. Let me explain. What she is saying is that quantum particles start out as massless, dimensionless, units3 that only develop length, width, height, and mass in relation to one another. Take for example the Higgs Boson: it is theorized that other particles only have mass in relation to the Higgs Boson. It is further theorized, and there is now some evidence to suggest,4 that other elementary particles do not have the three dimensions of length, width, and height except when operated upon by other unknown particles. What are the philosophical implications of this? If the universe is a massless, dimensionless void except in relation to greater powers, then it seems it would be more accurate to say that we live in a spiritual universe rather than a material universe. Now, if everything starts out dimensionless and ethereal before it solidifies into dimensions and masses, then we are closer to a spirit world than we might have otherwise imagined; and then, truly, everything is holy. I went for a run yesterday and as it had been a few days since I had been out on the streets of Calgary, my muscles were complaining and suggesting that I was not going to make the full distance I had set out to achieve. I soon recognized this for what it was, a psychological battle. I did not need to convince my muscles, lungs, or heart that they should go on for the full distance, I had to convince my mind. There were several places where I was tempted to cut the run short by taking a path that would get me home sooner. It was not until I had passed the last such short-cut that I found myself relaxing and enjoying the day. When I arrived back at home, I was pleasantly surprised to find that I had achieved my goals for both distance and speed. Convincing oneself to keep on running the full distance is a relatively easy task, but it is a helpful metaphor for the challenges of life. Thomas Jefferson said, "Nothing can stop the man with the right mental attitude from achieving his goal; nothing on earth can help the man with the wrong mental attitude. "1 The author of Hebrews wrote, "let us lay aside every weight, and the sin which so easily ensnares us, and let us run with endurance the race that is set before us . 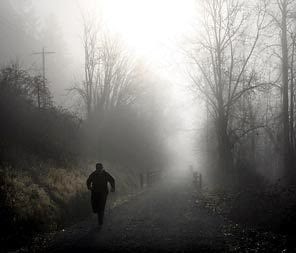 . ."2 This day, I will run with endurance and in all things I will seek a right attitude. Somebody should write a book someday about the silences in Scripture. Maybe somebody already has. "For God alone my soul waits in silence," the psalmist says (62:1), which is the silence of waiting. Or "Be not silent, O God of my praise," which is the silence of the God we wait for (109:1). "And when the Lamb opened the seventh seal," says the book of Revelation, "there was silence in heaven" (8: I) - the silence of creation itself coming to an end and of a new creation about to begin. But the silence that has always most haunted me is the silence of Jesus before Pilate. Pilate asks his famous question, "What is truth?" (John 18:38), and Jesus answers him with a silence that is overwhelming in its eloquence. In case there should be any question as to what that silence meant, on another occasion Jesus put it into words for his disciple Thomas. "I," he said, "I am the truth" (14:6). From a sermon by Frederick Buechner entitled “The Truth of Stories;” in The Clown in the Belfry and also in Secrets in the Dark. With thanks to the Jordan Blasetti and Mahogany Church for drawing my attention to this quote. The Jet Propulsion Laboratory (JPL) is a facility in Los Angeles County, California that can trace its history to the early 1940s. At that time, rocket motors were a new development and the lab was an arm of the American military. A little known fact about the early years of JPL gives insight into both computing power and gender roles in America during that era. How does one describe the shape of an ever-expanding universe? It is not easy to imagine what it might look like. Neither was it easy for some to imagine a spherical earth. For many centuries, the best model for the shape of the earth was a flat disk. This model held sway for at least five centuries in the Common Era (CE); and, even then, a spherical model was only adopted in certain Greek philosophical circles. Imagine for a moment how difficult it would have been to conceptualize that if you traveled west long enough you would arrive back at your point of departure. Returning to the shape of the universe, apply such imagination to its shape. What if someone told you that if you kept going in one direction in the expanse of the universe, you would one day come back to your point of origin? Would that be similarly hard to comprehend? That is precisely what would happen in the current best model for the shape of the universe. The model is represented by a toroid. 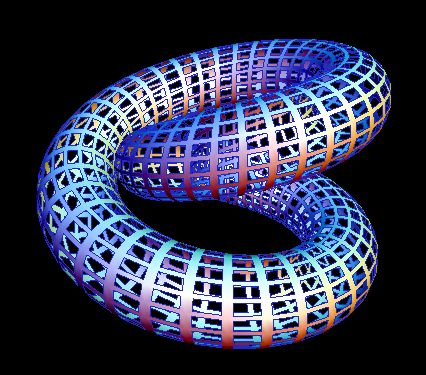 It is sometimes described as a donut shape but a donut shape is only the simplest of the toroidal shapes. The shapes pictured in this blog also define toroids. The best calculations by mathematical physicists tell us that the universe is close to completely flat and could fit on the surface of such a toroid. This is a shape that is definitely hard to conceptualize for very long. I think it must have been brief glimpses into the mysteries of the universe such as this that led Albert Camus to say, “Beauty is unbearable, drives us to despair, offering us for a minute the glimpse of an eternity that we should like to stretch out over the whole of time.” We can only hold such images in our minds for the briefest of moments before they escape us or drive us mad. Those who lived in a "flat disk world-view" must have felt the same. How could one hold onto this concept for more than a few seconds? It was outside of the experience of all people until a few brought back reports of strange journeys and new understandings of geography and geometry. Now, although we take it for granted that it can be done, few have circumnavigated the globe to prove the theory. I can only dream of what the experience might be like and only astronauts have a true, immediate, experience of circumnavigation. But, in my mind, momentarily, I can capture the mystery. Nature; Published online 23 May 2008 | Nature | doi:10.1038/news.2008.854; "Doughnut-Shaped Universe bites back: Astronomers say Universe is small and finite."